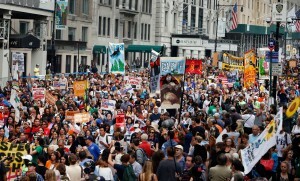 On September 21, 2014, 400,000 people marched for climate justice in the largest environmental protest ever in the U.S. This historic mass mobilization followed the tens of thousands protesting against the Keystone XL pipeline in 2011 and 2013. 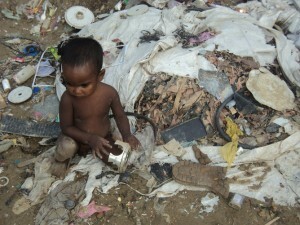 Scientists have warned again and again that urgent action is needed. But the establishment politicians have failed to act for decades – and now, to overcome this obstacle, many are drawing the conclusion that we need to take matters into our own hands with protests and direct action. As Naomi Klein laid out in her new book, This Changes Everything, what is needed to stop global warming is nothing short of a revolution in the way our economy functions: To stop climate change, we need system change. And changing our economic system to focus on human need and environmental sustainability, rather than on profits for the 1%, is in everyone’s interest. But challenging the for-profit system of capitalism means taking on the most powerful corporations in the world, with vast resources at their disposal to confuse and divide us. Fortunately, we are many and they are few, and the awakening and uniting of the social forces needed for this mighty task has already begun. The Earth has warmed roughly 1° Celsius since the dawn of the Industrial Revolution. Yet this seemingly tiny increase has unleashed deadly heat waves, persistent drought, wildfires, massive flooding, devastating hurricanes, and extreme weather events. It has destabilized the West Antarctic Ice Sheet, a massive block of ice that is now projected to melt completely in the coming centuries, raising the sea level globally by 10-13 feet. 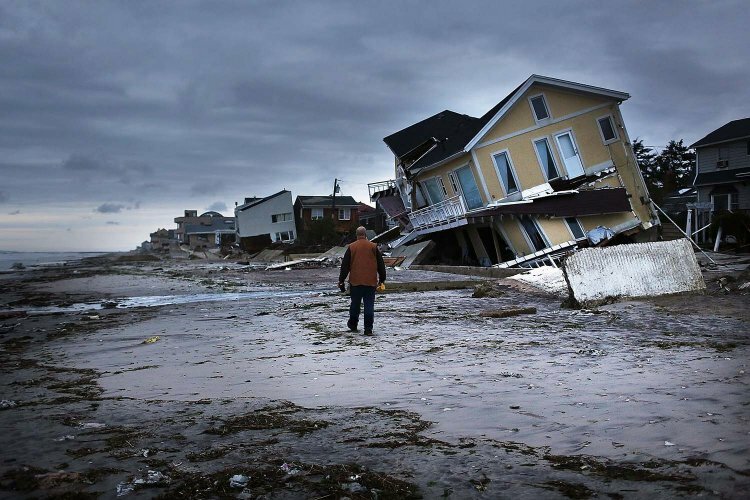 Whole island nations and vast swaths of coastal regions inhabited by hundreds of millions of people will be lost under the rising ocean. All this from just 1 degree of warming. Imagine the consequences of allowing Earth’s temperature to increase another 1-3 degrees, as predicted. Clearly, without a major effort to halt global warming, our ability to withstand the impacts will be completely overwhelmed. Scientists have calculated our “atmospheric carbon budget,” how much fossil fuel we can burn and keep the total warming to just two degrees. Their calculations indicate that we have roughly 30 years left, at current rates of carbon emissions, to transition to renewables and adapt to the changes already underway. So there is time. But, after more than 20 years of “climate talks” and continued expansion of the oil and gas industries, it’s clear that there are massive obstacles to transitioning our global economy to operate on clean energy under the current political and economic system. The battle over the Keystone XL pipeline provides an important lesson for future battles with Big Oil. Coordinated action, mass protests, and mass civil disobedience – in short, disrupting the status quo – is our most potent tool for changing policy. 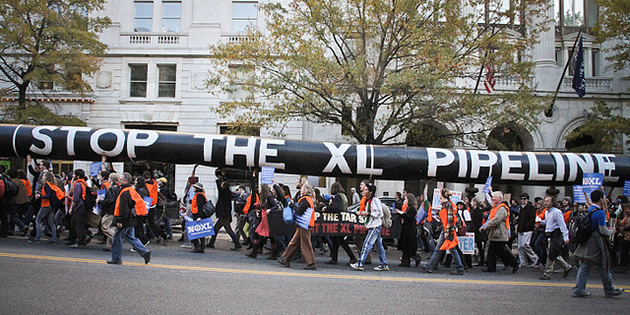 The Keystone XL pipeline was once considered a done deal. Yet three years of persistent campaigning, thousands of arrests at the White House, tens of thousands marching in Washington, and ongoing resistance from frontline communities have moved the probability needle from definitely to maybe. Mass demonstrations forced Obama to pause and reconsider. Imagine what millions in the streets could achieve. Earth Day 1970 saw 20 million people participate in mass demonstrations on college campuses, high schools, and city squares nationwide. These demonstrations offered people a way to express their anger at rampant pollution and their desire for reform, and they were central to the passage of the landmark Clean Air and Water acts. In the absence of mass movements, many young people and activists are turning to direct action – blocking railroad tracks or the construction of pipelines, for example – to force change. Given the urgency of the need to stop fossil fuel corporations from destroying our environment and disrupting the climate, it’s no wonder more and more people see the need to take matters into our own hands. Direct action is a powerful tool, but it’s far more powerful when linked to building a mass movement. In Washington State, a number of activists, the author of this article included, have been arrested blocking railroad tracks to protest potentially explosive oil trains from passing through communities. This has helped raise the issue in public debate. But to really stop oil trains passing through our communities once and for all means winning over the majority of working people to a much bolder political program to address climate change – in essence, building a massive social and political blockade against Big Oil. In the face of extreme weather disrupting our lives and destroying entire communities, concern about climate change has grown substantially. A recent poll showed 74% of Americans think the federal government should be doing more to tackle global warming, including 51% of Republicans. Big Oil knows there is a battle for public opinion. 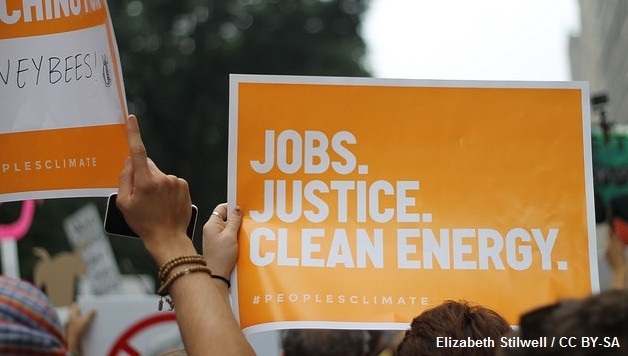 The main way corporations combat the environmental movement is by emphasizing the importance of fossil fuels for jobs and forcing people to choose sides: jobs or the environment. For the majority of people, jobs and wages are paramount. In some places, whole communities are dependent upon the fossil fuel industries for paychecks to support families. Without a massive jobs program that provides a real alternative for these workers, it’s understandable why many will accept the continued destruction of the environment. The struggle against climate change is, therefore, a struggle to relieve people of their daily worries through the creation of living-wage union jobs. 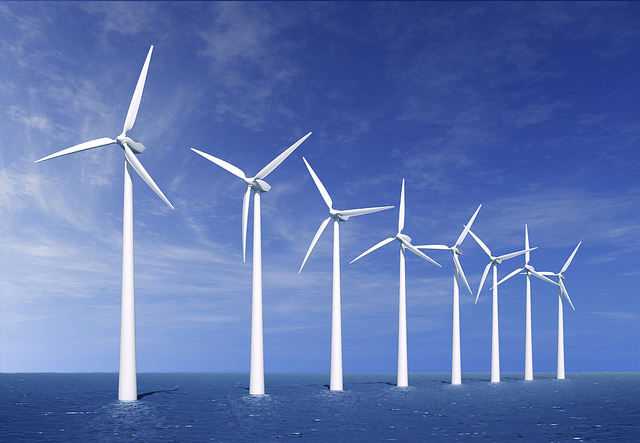 Stopping global warming, halting greenhouse gas emissions, requires a major jobs program, a massive investment in infrastructure projects aimed at expanding mass transit, building a new electric grid, and producing the technology – thousands of windmills and millions of solar panels – necessary to replace fossil fuels as our main energy source. By focusing the movement’s demands on creating millions of living wage union jobs and a “just transition” for all fossil fuel workers, with guaranteed retraining and rehiring in the new industries, we can win the majority of working people to a sustainable alternative. In particular, fossil fuel corporations try to divide the environmental movement against the organized labor movement. Yet 75 labor unions marched with environmental activists in the People’s Climate March. 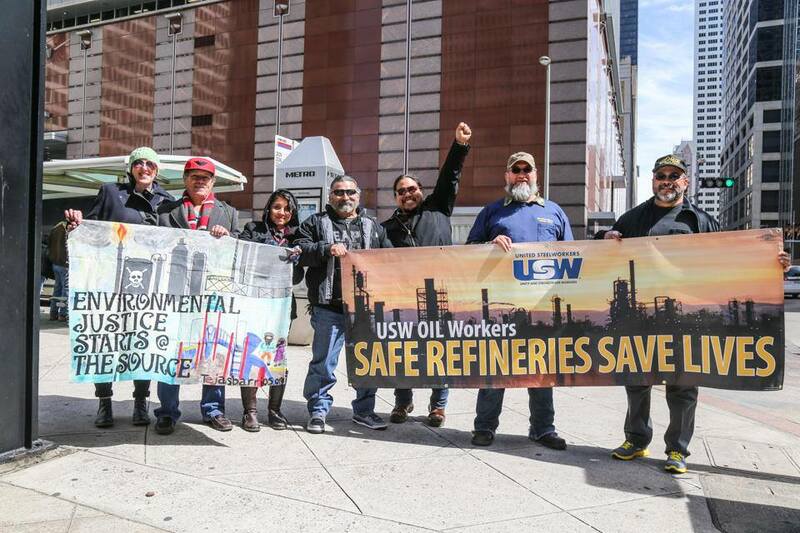 The recent strike at oil refineries – where members of the United Steelworkers (USW) walked out to protest unsafe conditions – shows that the jobs Big Oil promotes are incredibly dangerous, and the working conditions brutal. By supporting union struggles like these, and fighting alongside workers for good-paying and safe jobs, we can combat Big Oil’s divide-and-rule tactics and unite the environmental movement with the power of organized labor. We are told that the genius of capitalism is this: the profit motive of this system perfectly aligns with the greed inherent in all humans and this combination will generate new technology, new industries, and new jobs. But capitalism hasn’t actually delivered for the vast majority of people on the planet. Rather than motivate equitable sharing of resources and wealth, capitalism actually incentivizes a tiny minority of people on the planet to continue amassing a hoard of cash while the vast majority of people are living in squalor. Under capitalism, access to safe, clean drinking water, sanitation systems, healthy food, quality homes, education, and good jobs are denied to billions of people. Furthermore, capitalism creates competition among countries, where each nation is competing with other nations for raw materials and markets to sell its goods. An international agreement to seriously curb carbon emissions and transition to renewable energy is effectively blocked as each world leader refuses to agree to anything that might lose him or her a competitive advantage over a rival. But until we uproot capitalism and replace it with a new socioeconomic system based on human and environmental needs, we need to fight in the here and now for every regulation we can win against the giant oil corporations. We need to strip away their unnecessary tax subsidies and divert that money to clean, renewable energy projects. All new fossil fuel projects should be met with massive public opposition in order to prevent their completion and demand the resources be used for clean energy. But what strategy can rein in the power corporations have? 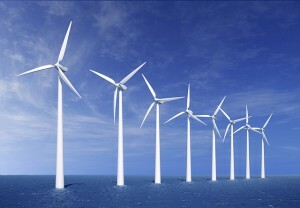 They have enormous resources and control the flow of energy necessary to make society run. They have used this power to wreck our planet. What right do they have to control these resources? We need to build a movement powerful enough to take these resources out of the hands of these corporations and into public ownership, under the democratic control of working people. Eminent domain is being used to seize the lands of small farmers to build the Keystone XL pipeline. This is backwards; we should be using eminent domain to seize the resources controlled by the ruthless corporations that are trying to force the Keystone XL pipeline on our planet. On the basis of public ownership of the biggest corporations, we could democratically plan the economy and rapidly transition our economy to clean energy sources. Rather than a handful of rich corporate executives deciding everything, decisions would be made with full participation of working people and the community. Clean energy technology, along with other advances in sustainable development, would be shared widely, allowing developing countries to grow their economies without destroying the local environment. Socialist planning would allow us to tackle climate change without lowering living standards. Efficient use of resources would dramatically improve through the rapid development and implementation of sustainable forms of production, ending built-in obsolescence and making goods durable, reorganizing food production, and massively expanding public transportation. Application of new automation technology would relieve people from the burden of working long hours and allow more free time for family, community, and political activities. The vast majority of people on this planet want the same things: purposeful jobs with good wages and safe working conditions, healthy communities with quality housing, access to clean drinking water, healthy food, free education and health care, and an end to poverty, homelessness, and general want. If it were up to workers internationally, the technology, resources, and wealth would be used to create a better world. Millions had hopes that Obama would dramatically change course. After eight years of Republican climate change denial under President Bush, the EPA regulations on coal-fired plants, increased efficiency standards for cars, and investment in renewable energy all seem like major accomplishments. But the consequences we face today and in the future demand that we evaluate the efficacy of the Obama administration’s policy changes, not by comparing them to the policies promoted by the do-nothing Republicans, but by what is needed. Obama has promoted and overseen the largest expansion of oil extraction on U.S. soil in a generation. Oil production in the U.S. has exploded to roughly nine million barrels a day, a 72% increase since he took office. Last year’s production surpassed that of oil giant Saudi Arabia. Throughout, the Obama administration has made it easier for oil exploration and extraction, fast-tracking permits, and opening up millions of new acres on federal lands and offshore in the Gulf of Mexico, the Atlantic Coast, and the Arctic. Increased oil production also means increased oil transported throughout the country. Lacking the necessary pipelines to transport this new oil to market, corporations have taken to the railroads. Oil by rail has increased 4,000% since 2008, with more oil spilled from railroad derailments in 2013, over one million gallons, than in the previous 40 years combined. Fracking also got a boost from the Obama presidency. To the dismay of many environmentalists, Obama promoted the natural gas boom, which employs fracking technology to get at shale gas reserves deep underground, as providing a “bridge fuel” that would supposedly allow us to transition from coal to renewables. But scientists have warned that natural gas extraction actually exacerbates global warming. The Republicans are clearly more rapacious in their pursuit of the interests of Big Oil. Undoubtedly, large numbers of people will vote for the Democratic Party because Republican policies are disastrous. But, as Obama’s record shows, the Democratic Party is also serving the interests of Big Oil and cannot be relied upon. We need movements to be independent of both parties. 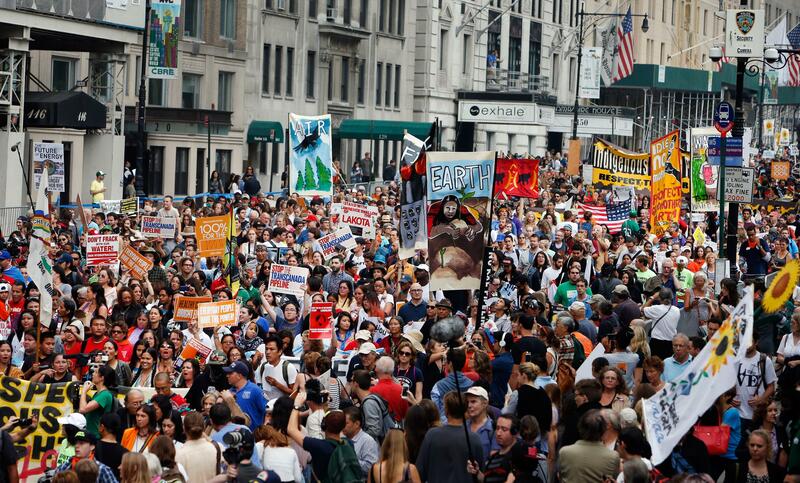 The climate movement held back from protesting during the 2012 presidential election cycle. We cannot allow our movement to be demobilized during elections in the hope that electing Democrats is enough. We need to keep the pressure on, even at election time. The best way to do that is by building a political alternative that refuses corporate donations and puts forward a platform centered on people and the environment, not on corporate profits. Such a platform would include a bold call to “keep the carbon in the ground,” and a massive jobs program, putting millions to work in living-wage jobs rebuilding our infrastructure and retooling our economy to run on clean energy. It is through electing independent, left-wing representatives, like socialist Seattle City Councilmember Kshama Sawant, into the halls of power – backed by millions of people on the streets – that we can force our demands onto the agenda, despite fierce corporate resistance.